READ my blog posts for a glimpse into a variety of active travel trips I’ve enjoyed throughout the years. The “Cycling Pilgrim” blog posts first appeared in Women’s Adventure magazine online. I always have trouble summarizing epic journeys or trips of a lifetime.There’s so much to tell about every inch of the journey. That’s not so easy to do because I want to tell you everything. What you need to know is that “The Camino” is not just a bike trip. It’s not just cycling along a historical path and it’s not just a trip for the legs and the lungs. It’s a trip for the heart and the mind too. “The Camino” (short for Camino de Santiago–The Road to St. James) is a hiking and biking route like no other. It’s otherwise known as “The Way of the Pilgrims,” a medieval trail that was originated by Christians walking from various points in Europe to the village of Santiago de Compostela in Northern Spain. The journey could take months and months to complete under all kinds of conditions. Since St. James was the first recognized Apostle to be buried in Europe, Christian followers made their way over hills, mountains, rivers, streams and scorching flatlands to pay homage to the burial site of St James, featuring the Cathedral of Santiago de Compostela, to ask forgiveness of their sins or to be cured of illnesses amongst other riveting reasons to travel thousands of miles to pray over the divine relics. Eventually, the numerous pilgrimages over the centuries led to defined routes leading directly to Compostela de Santiago which is now a UNESCO Heritage Site and Trail. Keep in mind, I am attempting to summarize why The Camino is such a historically significant trail system. For a more comprehensive background, take a look at these websites: Santiagoturismo.com, andalucia.com, spain.info/en/, santiago-compostela.net. So why would I go on a 500-mile bike odyssey in Spain? Well, if you are really curious read the Travel Trends piece on pilgrimages that I wrote in the Fall issue of Women’s Adventure magazine. The route has been a travel adventure on my bucket list for several years. I’ve always been fascinated with the history of the Middle Ages; always wanted to visit Spain and it seemed like a good way to enjoy the food and wine of the area. But there is always a more compelling reason why we pick certain adventures or journeys to rouse our senses. Many times we don’t know the core reason why we have to go, we just know we have to do it. That was part of my reason, to experience the inward journey as well as the outward one. Discovery is part of the adventure. bike tour offered by ExperiencePlus! Bike Tours. The big bonus for me was the ability to cover the French route from the Pyrenees (Roncesvalles) of Spain to Santiago via bicycle with a SAG wagon and hotels with showers everyday. The company’s full-service Camino de Santiago Bike Tour has been recognized as a National Geographic Traveler “Trip of a Lifetime” and is one of the few cycling group tours offering The Camino. So, could ExperiencePlus! Bike Tours “walk the talk” or was it a canned route with imposed souvenir stops with impersonal robotic guides offering mere factoids each day? Would the trip meet my bucket list expectations? But more importantly, could I really do the whole thing? Was I up to cycling 30 to 70 miles per day on varied terrain, including sustained climbs? At least I had the foresight to bring along a big bottle of ibuprofen. At the group’s starting point in Roncesvalles, near the border of northern Spain and France, the road sign yielded the mileage we had to cover: 790 km to Santiago which is roughly 500 miles. Seeing the sign for the first time hit a nerve, we were like a herd of excited horses queuing up for a race; more than ready to begin spinning our wheels along The Camino. Sure, the acclaimed “city by the bay” boasts a cultured culinary scene, cable cars, and the world-famous Golden Gate Bridge, but the San Francisco Bay area is also home to one of the largest urban parks in the world. The Golden Gate National Recreation Area (GGNRA), a sweeping swath of bay and ocean shoreline, encompasses 59 miles of sublime outdoor paradise with an endless variety of excursions—from hiking and mountain biking to windsurfing and sea kayaking—for every level of adventurer. 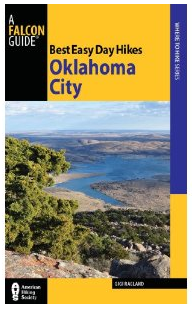 Best Easy Day Hikes Oklahoma City includes concise descriptions and detailed maps for 19 easy-to-follow trails where hikers of all skill levels can watch wildlife, trek alongside lakes and rivers, and enjoy the sunset.